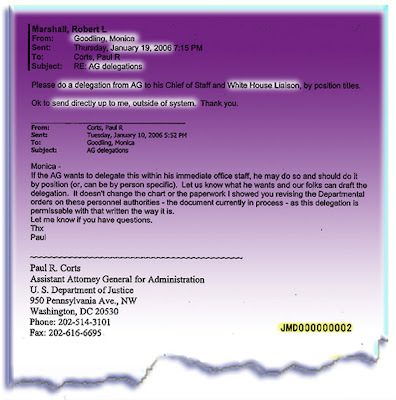 more e-mail confirming monica goodling’s misdeeds at DoJ. . .
(and to be made available on rep.
smaller blanks we were missing. . .
but, i digress — where was i? about at the end of april 2007. . .
to further discredit ms. goodling, now. . .
attorney general on hire-fire decisions. . .